Some months ago I wrote about another Miso Kovac’s record from the eighties. I have no intention of turning Miso into a mainstay of these pages but this sleeve is just plain good and I couldn’t pass it. Miso was a young puppy when this 45 came out. Later in his career he started singing songs about Dalmatia. Those were simple love songs. “I’d give Anything For Your Love” and “My Blue Heart” on this record were debuted at music festivals in Sarajevo and Zagreb in 1970. The record was produced by the Company for Manufacture of Gramophone Records, Zagreb. This unappealing photograph needs a bit of explanation. Last name “Kovac” means “Blacksmith” in Croatian and other local languages. The caption under the photo reads “Blacksmith of gold records.” Cool, so he is beating metal into a best selling record. The funny thing is that the predigital disc he is forging looks like an oversized CD-R.
Here’s a music video of a “Dalmatian” song by Miso Kovac. It looks like an industrial video for a fishing company. 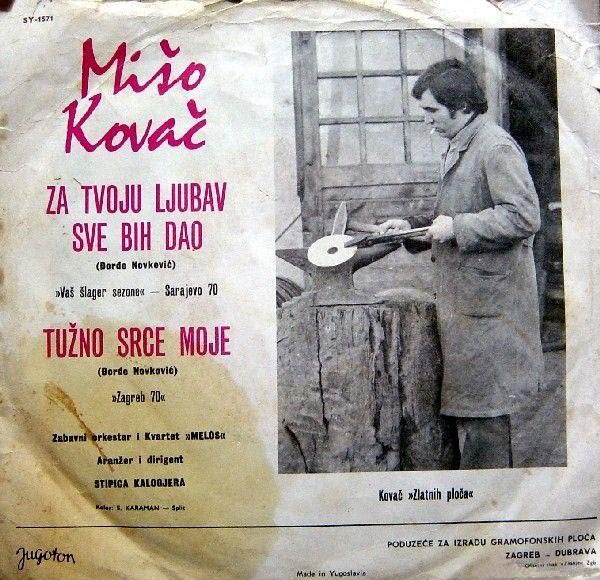 This entry was posted in Records and tagged Bad record covers, croatia, dalmatia, miso kovac, vas slager sezone. Bookmark the permalink.